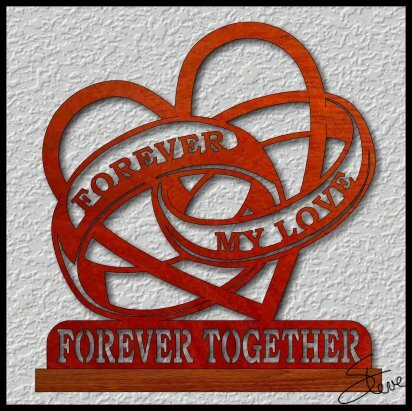 Wedding Rings Scroll Saw Pattern. 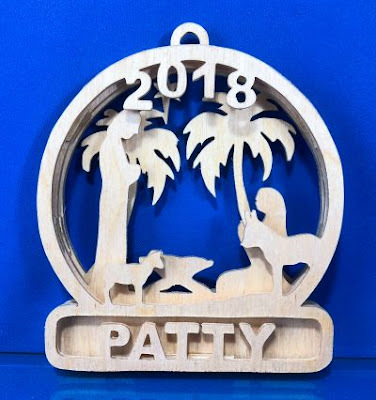 I have the 2018 Personalized Christmas Ornaments designed. I will start taking orders in the next two days. The price for the patterns will be the same as last year. 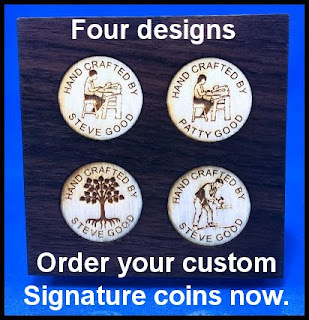 $1 per name with a 5 name minimum order. The door wreath will be $5 perpattern. Dog and Cat ornament pattern will be added later. For those of you who may be new here on the blog here are the details. 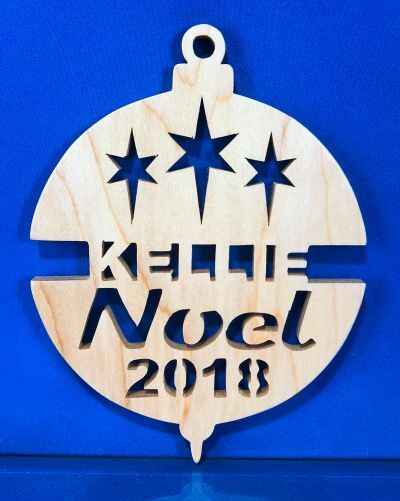 Every year for the last several years I have designed Christmas ornament patterns that I personalize with the names you need. 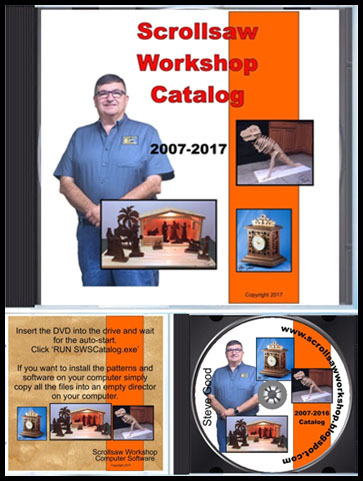 I take orders and deliver the patterns to you via email. You only pay after you have received the patterns and are completely happy. You will be able to pay online with a credit card or by mailing a check. For the last couple of years, I have also designed a door wreath. 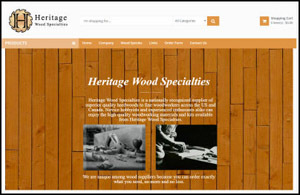 This is a larger pattern for your front door with your family name. You will also see that design below. One slight change this year is that all the ornaments have the date included. They are designed in a way that you can just not cut the date if you don't want it. This is the basic ornament. 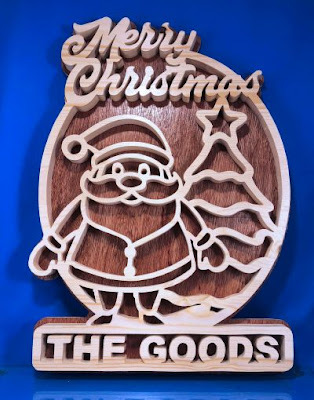 If you are new to scrolling you may want to consider this ornament. This is also a good choice for those of you who have dozens to cut. 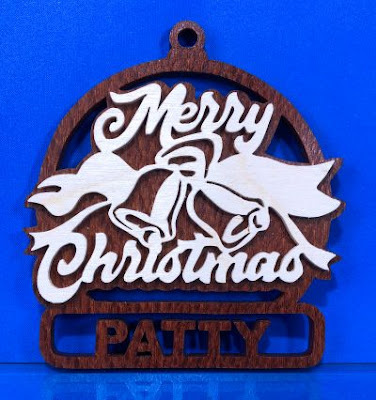 It is cut from 1/4" thick wood. This ornament is named Bells. It has two layers. This one is a bit more challenging. The strategy here is to stack cut the top layer for a few ornaments then just cut the individual name part of the pattern. That will speed up the process considerably. The back layer is 1/4" thick and the front layer is 1/8" thick. This ornament is the Layered Nativity Ornament. It has three stacked layers separated by spacers. Each layer is cut from 1/8" thick wood. This ornaments can also utilize stack cutting to speed up the process. The back two layers can be stacked because only the front name layer is different. Finally, we have the Front Door Wreath. I know it's not a wreath but that's what I call it. This pattern is 14 inches tall. It will include your Family name with the word "The" in front of it. Every year I get email about the use of the apostrophe in the last name. Here is how that will be handled. The apostrophe will not be added. An "S" will be added to the end of the Family name unless it already ends in "S". NOTE: I get asked every year if I will sell blank patterns. I do this to make money. I know I give a lot away for free but this is not one of those free items. Inlay in your project with a 1 inch Forstner bit. Great way to sign your work. DeWalt DW788 on sale at Amazon. $449. Hey guys, Amazon has the DeWalt DW788 marked down to $449 and free shipping right now. I don't know how long this will last but it's a pretty good deal. This does not include the stand but you can order that at this link if you need it. DeWalt Stand. The DeWalt DW 788 is a terrific mid-level scroll saw. 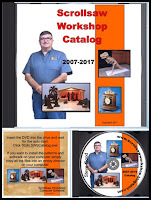 It has been around for many years and is probably the most popular scroll saw ever sold. If you have always used an entry level saw you will be pleasantly surprised by how easy the DeWalt DW 788 is to use. Low vibration and easy blade change are just two of it's high points. The above link is my affiliate link.